Last year the festival took new heights and welcomed attendees of all ages for a weekend of various music which spanned over many genres. The sold out festival provided something for everyone! Last year the festival brought: Katy Perry, Wiz Khalifa, Foo Fighters, Imagine Dragons, Robert Plantt, and many more to perform at the new-ish festival. They will be joined by a lineup of cross-genre hit-makers including Duran Duran, Black Eyed Peas,OneRepublic, Sheryl Crow, Maren Morris, a special collaboration from hip-hop stars Snoop Dogg + Wu-Tang Clan 25th Anniversary Set, plus Mark Ronson, The Revivalists, REO Speedwagon, The Bangles, The Cult, Sublime with Rome, Boyz II Men, and many more, including a yet to be announced special performance from the 2019 American Idol winner. Comedians Bert Kreischer, Pete Holmes & Friends, Wayne Brady, Bob Saget, Kevin Smithand more will lead the laughs on the HUMOR ME stage. As with any festival KAABOO definitely had its growing pains. The first couple of years the festival have added more options when it comes to food, beverages, while also mixing up the lineup a bit more so it can cater to palettes of many - making it a well-versed festival. With the backdrop of the ocean and engulfed in beautiful SoCal sunsets KAABOO Del Mar should be on your list! Last year was a first, of many, successes for the festival. 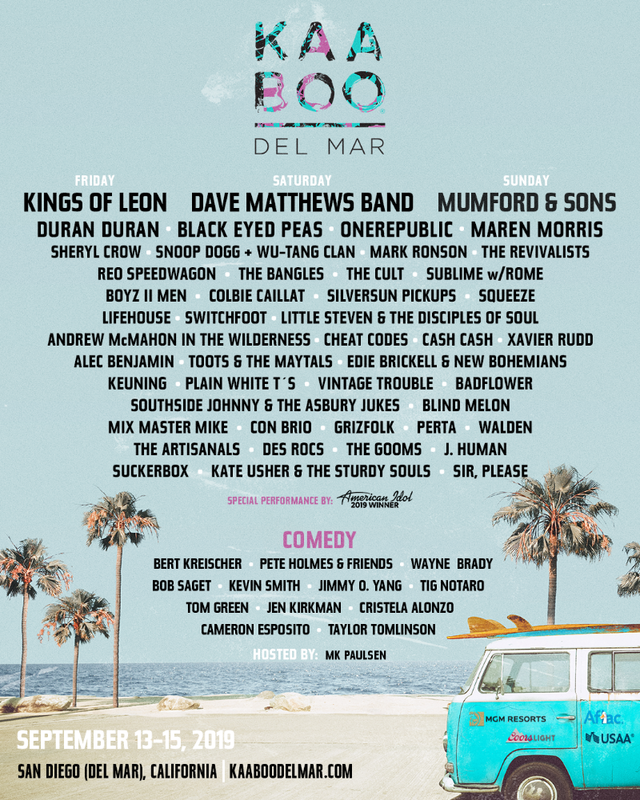 KAABOO Del Mar solidified its edge as a leading destination music and arts festival by selling out of all passes to last year’s 2018 Southern California experience. The highly-amenitized event is conveniently located at the Del Mar Racetrack and Fairgrounds in Southern California is bringing the heat for the fest this year after all it's San Diego’s largest multi-day major music and entertainment festival! There are many options to heighten your experience. From GA to VIP to purchasing BASK options (which give you lounge access to spend the day in a pool or rent your very own cabana, find out more HERE. KAABOO Del Mar is taking the festival experience to new levels. Earlier this year, KAABOO expanded internationally with KAABOO Cayman and proved that a luxury destination festival in the Caribbean is achievable with thoughtful strategy and execution. The sold-out event brought together live entertainment fans from around the world while hosting one of the largest festivals of its kind to ever hit the islands. It’ll be another great year at KAABOO Del Mar and you won’t want to miss this one!